Footwear Today is the UK’s top independent trade magazine for the footwear industry. Covering the latest industry and product news; footwear ranges; exhibitions, trade fairs and trend analysis, Footwear Today is an independent voice supporting and informing its readers in their roles as retailers and footwear buyers. The editorial team also tackles serious footwear and foot health topics in a bid to create forward thinking and inspiration, and prides itself on providing authentic industry opinion. Misfit, an independent footwear retailer, regularly speaks about current topics facing the footwear retailer, and Talking Shop takes a monthly look into legislation which faces all footwear businesses. Agent Provocateur explores issues across the independent/concession/multiple sector. Footwear Today covers the major footwear shows, with twice yearly previews and reviews of GDS, Micam, Moda and Pure, as well as more compact shows including the London Shoe Show and The Kensington Shoe Event. Our monthly ‘Legal’ page shows recent CCJs and insolvencies within our trade. Footwear Focus: Road Test – a member of Footwear Today’s editorial team (Henry Harington, Dawn Smith, Vicky Kember, Joe Maggio, Dave West & Arthur Howard) tests footwear in the field, aiming to provide retailers with not only information about the footwear, but also giving ‘real life’ facts about how the footwear performs – helping the retailer sell to the end user. Footwear Today also boasts a long heritage of support from footwear trade associations: IFRA (Independent Footwear Retailers Association), BFA (British Footwear Association) and The Society of Shoe Fitters all actively endorse our magazine. Quite simply, we are the footwear magazine, for the footwear trade. 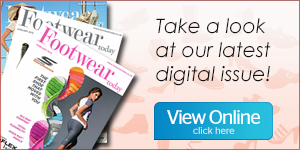 If you are a footwear buyer, you can receive Footwear Today free each month – please click here to register for your copy.